Recently, a friend was cooking at a dinner for eighty people, one of these social events where everyone pitches in to help cover the costs of the food. Being from the panhandle of Florida, she was preparing a Cajun-inspired menu and asked if I would help with the dessert. While I was originally going to make sweet potato pie, plans morphed and we ended up with pumpkin bars, which turned out nicely nonetheless. Sweet potato pie would have been much more authentic for a Cajun dessert but local sweet potatoes are very small and the larger imported sweet potatoes are ridiculously expensive. I opted instead for pumpkins, which are plentiful and much less expensive. 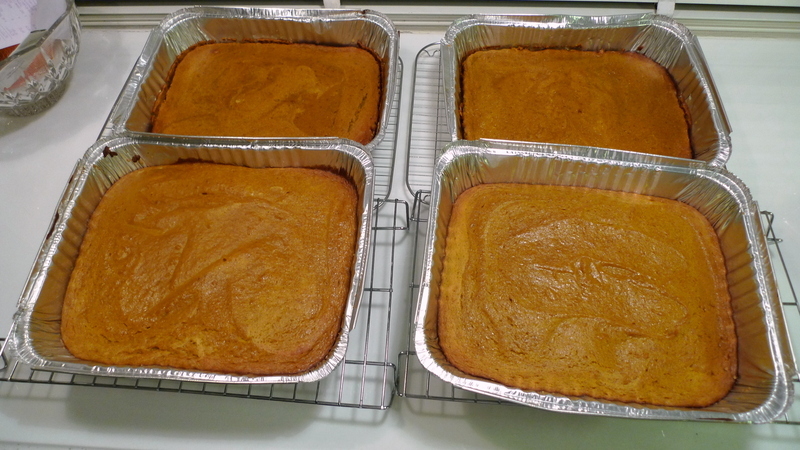 Scaling up from a recipe that serves maybe 16 people, I wasn’t sure just how much pumpkin I needed, so bought six. 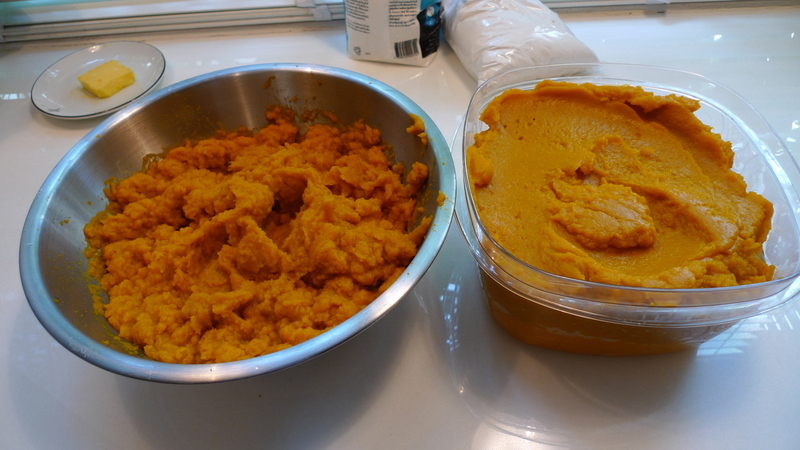 After cutting them, steaming them, and peeling and mashing the flesh, I had a lot of pumpkin puree. In fact, it was about half again what I ended up needing. That’s okay – you can freeze pumpkin puree. 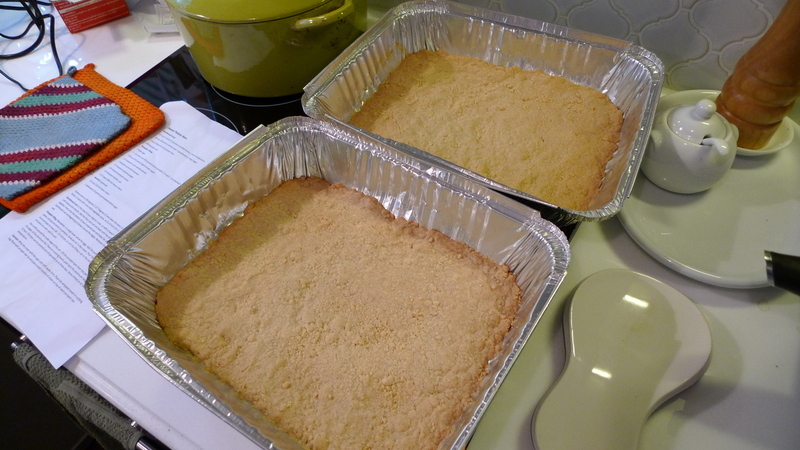 Instead of a usual pie crust, I decided on a recipe that used shortbread. Shortbread is not only easier to make than pie crust, it also adds a different dimension to the texture – providing a crispier base versus a tender and flaky one. Instead of pies, which would be more difficult to transport, I opted for four large aluminum trays that came with plastic covers. 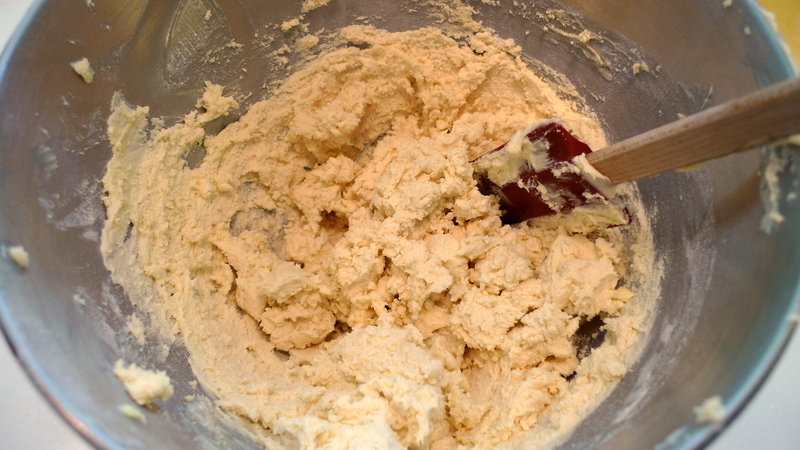 I spread the shortbread dough on the bottom and then baked it for about 15 minutes until it started firming up and tanning. 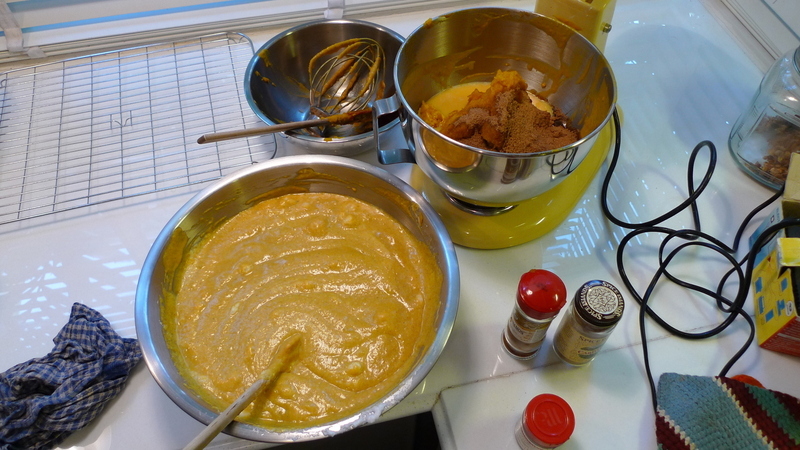 The filling was pumpkin puree, brown sugar, cream, egg yolks, cinnamon, cardamom, ginger powder, and cloves. I whipped egg whites in a separate bowl and folded them into the mixture, creating a lighter texture. The filling baked in about thirty minutes. After cooling to room temperature, I put the four trays in my refrigerator and carried them to the event the next afternoon. 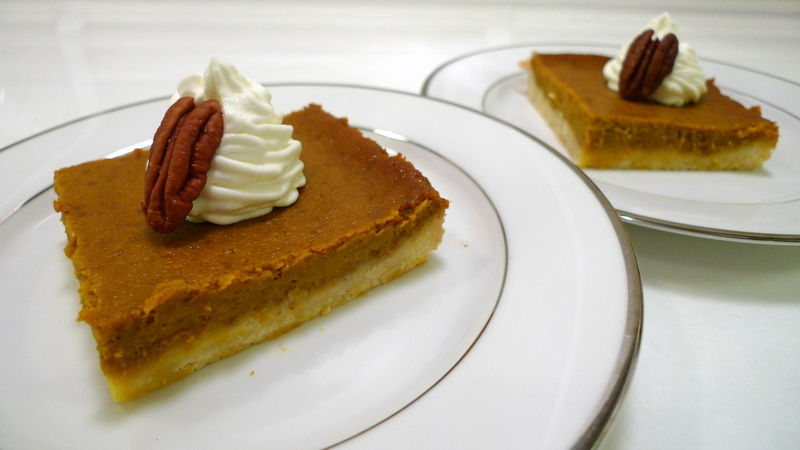 A little chilling helps film up the pumpkin pie and makes it much easier to cut and serve. The end product, shown from a smaller test batch I did two days before. This version didn’t have the egg whites whipped separately, so the filling isn’t as tall as in the final version. Still just as tasty, though! This entry was posted in Uncategorized and tagged baking, Bar, Cajurn, cooking, dessert, food, Pie, Pumpkin by christao408. Bookmark the permalink. Looks quite good. Thank you for sharing, as always! Craving for these now. Beautiful presentation! I guess I need to be local to your area to rec this blog.I also guess you added enough sugar to taste. That is a skill to learn I suppose. I love pumpkin – fixed anyway possible. Send me some. Looks like a great solution, Chris — how did you keep the shortbread from becoming soggy overnight in the refrigerator? Wonderful. Now I’m craving both pumpkin pie and sweet potato pie! *sigh* No pie for me. Looks delicious. It’s always interesting to read about your cooking/baking something for 80 people. Feels like an industrial kitchen. Have you thought of opening up a canteen? I just like how you make it look so effortless. Never thought of using shortbread for the crust. Great idea! mmm I like them dense. What Kind of pumpkin is that? Thaat must be very rich. Okay, now my mouth is watering and I want one of those, Chris!!! How about posting the recipe…..but not for 80. I have a can of pumpkin on my garage food pantry shelves. Thinking I could use it for this. @Gma_Joyce – I have to say, I sort of patched the recipe together from a few other recipes, so I don’t really have a “less than 80 servings” recipe! 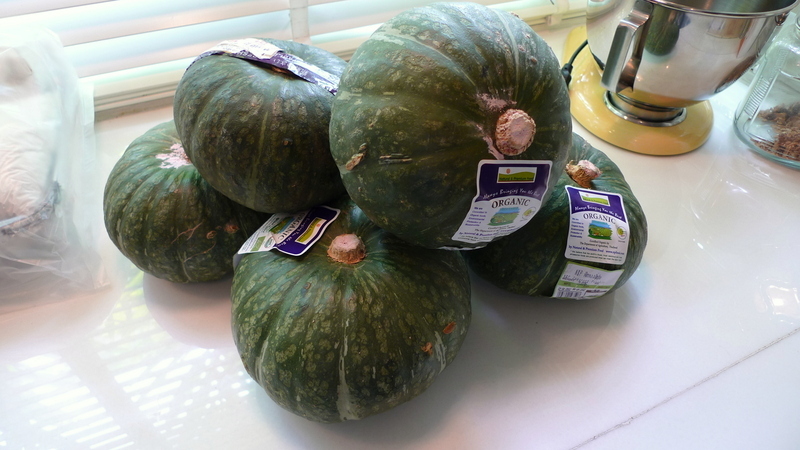 @Ikwa – They refer to them here as Japanese pumpkins, although I would imagine there is another, more proper name. @Inciteful – Yeah, that was a dessert where a two-inch square serving was plenty at one time. @stebow – It is a lot sturdier than a typical pastry crust. @rudyhou – @Fatcat723 – What!? You didn’t get the piece I sent you? Those darn customs officials! =P@ElusiveWords – The trick is to not show any of the mess… Ha ha! @beowulf222 – I have thought of it and since I know plenty of professional chefs, I know that I’d never want to cook professionally. Too much repetition. @murisopsis – Ah, no fair…@slmret – That’s a good question. It just stayed relatively crisp. Maybe because I precooked the shortbread? @PPhilip – Thanks for the attempted rec. Yes, I find seasoning to taste is the best approach because the flavor will vary every time. @CurryPuffy – Open windows and turn on the ventilation fans… close before mosquitos come in. LOL@nov_way – @awoolham – @vsan79 – Glad you enjoyed the entry. @petitetokio – Glad you liked it!